Goaltender Sean Maguire has signed a two-year, entry-level contract with Pittsburgh Penguins beginning in the 2016-17 season, the team announced Wednesday afternoon. He will first join the Wilkes-Barre/Scranton Penguins of the AHL on an amateur tryout contract for the rest of this year. A fourth-round selection (113th overall) by the Penguins in the 2012 NHL Draft, Maguire ended his senior campaign with a .920 save percentage and 2.41 goals-against average. Maguire also earned the 2016 Beanpot MVP and Eberly Award for the top goaltender of the tournament in his final year on Commonwealth Avenue. Maguire ended his BU career with a 29-29-2 record and .922 save percentage in three seasons. He is the fourth player since the end of the season to sign a professional contract, joining Matt Grzelcyk, Danny O’Regan and Matt Lane. Quinn: BU’s ‘season ended at Notre Dame,’ but what exactly went wrong? 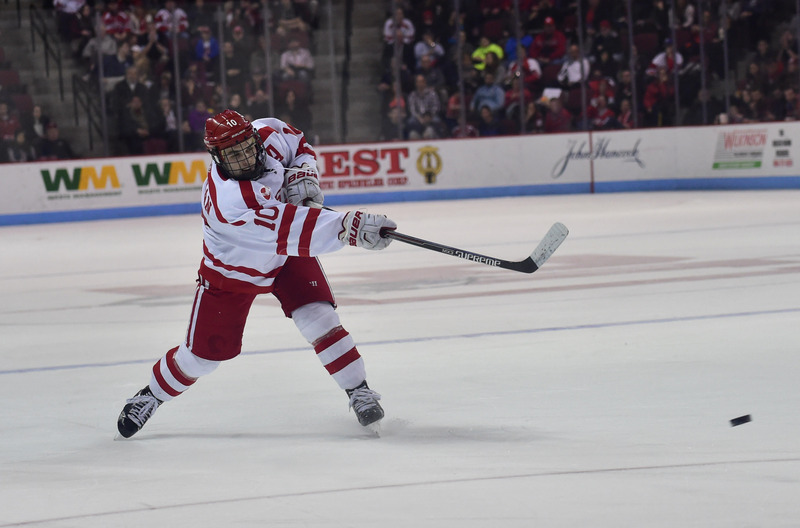 Following the Boston University men’s hockey team’s season-ending loss in the NCAA Tournament to the University of Denver on Saturday, head coach David Quinn had a theory. Considering BU’s lackluster postseason run — if you can even call it a run — where it barely knocked off a last-place University of Massachusetts Amherst team in the first round and then got railed by the University of Massachusetts Lowell the following week, that’s a fair assessment. BU’s last “feel good” victory probably came at the University of Notre Dame on Feb. 26, which works out to a full month of pretty disappointing playoff hockey. 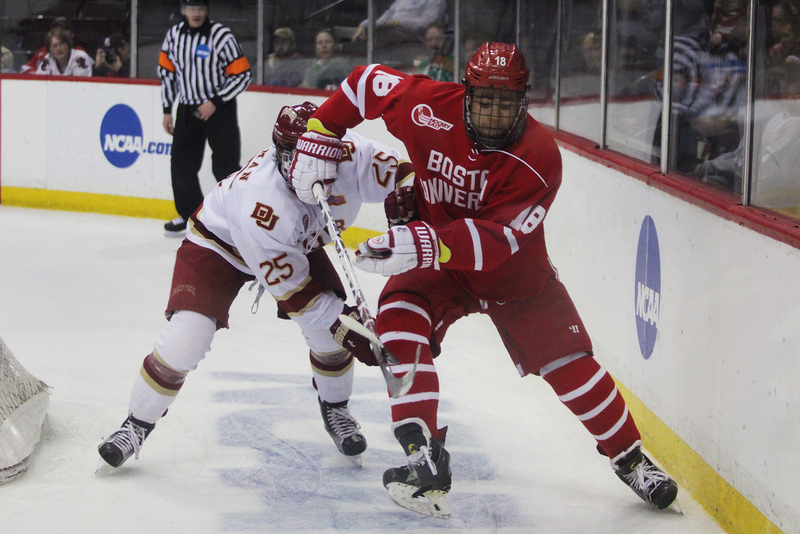 But as some have mentioned in comment sections and on fan forums, it seems as if BU’s season began its downward spiral during and after the Beanpot final against Boston College. The team had just five wins in 12 games between the Beanpot and the final game of the season, with six losses and a tie mixed in. Of course, we can’t really get into the heads of what was going on mentally during that span, but we can point to a few things in particular that we were able to see on the ice over the final weeks of the season that could possibly account for the slip-up. Twelve goals allowed in two games. That makes it hard to win at any level, especially in the NCAA against top teams like the University of Massachusetts Lowell and Denver. And BU didn’t win either of those games, and none down the stretch in what became its final three games of the year. But who’s really at fault? Is it senior goaltender Sean Maguire, who didn’t look exactly like himself during the team’s postseason run? Based on a lot of the discussion on the live blogs here, some believe that to be the case. But let’s set the record straight. Maguire was nowhere near as sharp as he had been earlier in the season during the past few games. For long stretches, like during the Beanpot, he was absolutely lockdown in the crease. He was far from it during the Hockey East Tournament and one game in St. Paul. But the onus should not fall squarely on his shoulders. Far from it, actually. Because without Maguire, BU maybe doesn’t even make it this far in the season. Some soft goals were let in, yes, but Maguire’s defense in front of him was poor and did not play particularly well in its own zone. Especially against Denver, there were plenty of turnovers at the defensive blue line, and both he and sophomore Connor LaCouvee were hung out to dry multiple times. This team’s defense was supposed to be the core, the big factor in why this year’s team would be in contention for another Frozen Four run. And, at times, the unit did play up to its potential. However, there were too many instances, like Saturday’s loss, where the D corps failed to show up. Senior winger Ahti Oksanen said a lot of the talk and work in practice over the last two weeks was based on defensive zone coverage and just generally being more responsible with and without the puck. Maybe for the first 10 minutes of the game things looked better, but by the time BU failed to convert on its second power play of the first period, everything spiraled out of control. The attention to detail and lack of control in the defensive zone allowed Denver to walk all over BU for most of the night. 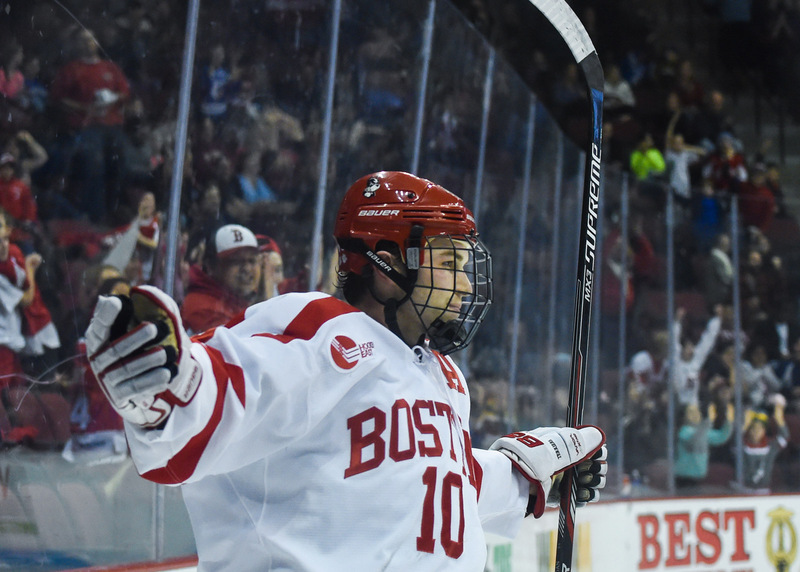 For the first time since Frozen Fenway in January 2014, BU gave up seven goals in one game. Defense clearly was an issue, but this argument almost becomes a moot point due to the fact the offense did next to nothing. It wasn’t as if the offense just struggled against Denver, the issues seem to go all the way back to at least the Beanpot title game against Boston College. Consider this: BU played eight of its final 12 games against teams that made the NCAA Tournament (one of those games being in the tournament against Denver). And in those eight games, the Terriers recorded just 11 goals. That’s 1.375 goals per game against tournament-level teams. Three times in those eight games, BU was shut out. The team was not once held goal-less in its first 27 games of the season. 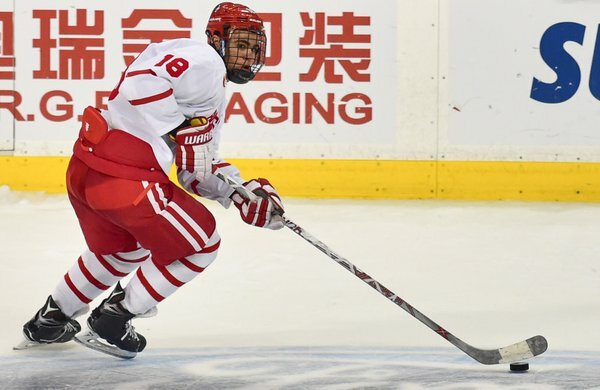 It’s hard not to take notice, specifically, of the impact on the offense when freshman forward Jordan Greenway moved back to the first line after playing 15 games on the second line with seniors Matt Lane and Ahti Oksanen. Greenway had seven points in his final nine games on the first line, but had 15 points in the 15 games he played alongside Lane and Oksanen. Lane, meanwhile, had three points in the final nine games without Greenway on his line. In the 15 games he played with Greenway on his line, he had 16 points. Oksanen, with Greenway on his line, he had 20 points in 15 games. Without Greenway, he also had three points in his final nine games. Furthermore, in the span that BU had that combination of players on the second line, the team had a 10-4-1 record, and averaged 3.8 goals per game. After moving Greenway, the team went 4-4-1 and averaged 2.22 goals per game. Save for Greenway’s move to the first line, and a brief stint from Bobo Carpenter on the second line, we seldom came to the rink this season and were shocked by any sort of move on the line charts. That goes for both forwards and defense. And there were plenty of arguments from fans about lack of depth, lack of options, but here’s the thing: The Terriers still had options. Not many, but options existed. The most prominent example of this came on the defense, though. It was something I asked in January when we were at the University of Maine — was Quinn just going to keep rotating that sixth defenseman spot between Brien Diffley and John MacLeod? Was that a tangible solution going forward? He said he didn’t look at it that way, and he said he’d reward whoever was playing best in practice. Yet that remained essentially the defensive situation — Diffley in sometimes, MacLeod when he wasn’t — for the remainder of the season, with the other five spots locked. In games where he had his entire defense, all eight players, at his disposal — no injuries, suspensions or World Juniors appearances — the locked-in pairs of Matt Grzelcyk/Charlie McAvoy and Brandon Hickey/Brandon Fortunato never changed. Not once, until Saturday’s game, when he put MacLeod back with Grzelcyk. We don’t see practice, but we see the lack of adjustments during game time — and that suggests a lack of accountability. A bad performance won’t put your spot in the lineup even remotely at stake, and it didn’t seem like players were forced to prove anything. Something I don’t think I’ll be able to let go of about this season: The defense that was supposed to be one of the best in the nation, and ranked 30th in the nation after Saturday’s game. It regressed from last year, and didn’t do anything to get better as the season went on. I might be a bit more sympathetic if they’d tried to mix it up during the season and it still didn’t work. But that didn’t happen. LOWELL — At the Tsongas Center on Saturday, things got bad quickly, and then they got even worse. The No. 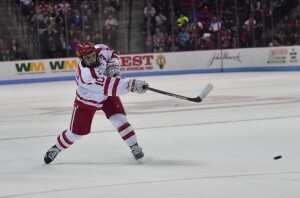 8 Boston University men’s hockey team needed a win to advance in the Hockey East Tournament, after losing the first game of the best-of-three series on Friday to the No. 11 University of Massachusetts Lowell. It was never really a contest. Lowell took a 3-0 lead by the end of the second period, and added two more goals in the final frame for a 5-0 final result, sweeping BU and ending the Terriers’ chances at a Hockey East Tournament run. Usually we say we have some things we like, things we didn’t like — but tonight, there really wasn’t much to like. So really, here’s a breakdown of a whole lot of things we didn’t like — and here’s another take of just how wrong things went, brought to you by Judy. Credit to Lowell’s goaltender, Kevin Boyle, who secured a new school record for shutouts in a single season when he got his seventh of the year on Saturday. Boyle attributed his teammates for blocking shots — BU had 70 shot attempts, but only 24 of them went on net, the lowest total for BU since a 4-2 loss to Michigan on Nov. 21. For the most part, save for “a pretty good flurry right before they made it 3-0” that BU head coach David Quinn noted, it never felt like BU was ever threatening. Only one player had more than four shots — freshman forward Ryan Cloonan, who hasn’t had more than two shots on goal since January — and BU’s usual suspects shooting-wise, seniors Ahti Oksanen (one shot on goal Saturday), Danny O’Regan (three SOG) and Matt Lane (three SOG), were kept relatively quiet. After Lowell’s second goal, Quinn decided to pull starting goaltender Sean Maguire and replace him with sophomore Connor LaCouvee, which had all three of us sort of scratching our heads — and a lot of the BU fans near where we were sitting were scratching their heads, too. Quinn referred to the decision as a “gut feeling.” While neither of the goals was exactly the most difficult test Maguire has had to face this year, it seemed a bit odd at the time. But it’s not like BU had any goals by the end of it, so it didn’t really matter by game’s end whether the goalies combined to give up only two goals or five goals. And it’s not on us really to say whether Maguire would have given up the three subsequent goals that LaCouvee did once he took over, or if Maguire would have settled down after that. There’s no real reasonable way to predict that. But at the time, it was a questionable move, at least to me, that you’d pull the guy who’s been the one to overwhelmingly keep you in games all season long. 2-0 isn’t an insurmountable deficit to overcome — BU’s done it before — so it still seemed pretty premature, gut feeling or not. The team mentality — missing? 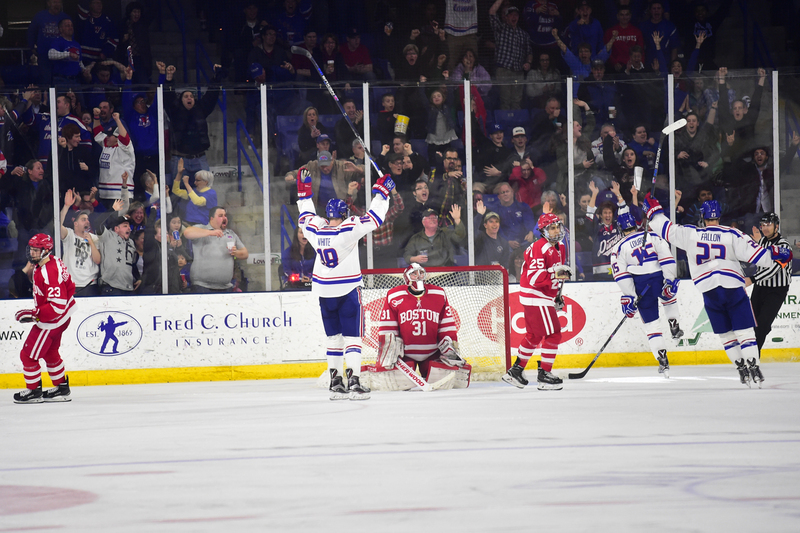 Something the three of us have admired in our time covering college hockey is how well UMass Lowell always seems to do for having, relatively speaking, not a whole lot of “star power,” at least in the traditional sense. And a pretty interesting point was brought up Saturday, so I think it’s worth discussing in terms of comparing BU to Lowell. Quinn noted that the River Hawks “may not have stars other than their goalie, but a lot of good players.” Which, if you’re looking at awards, recognition, et cetera, is true — just one of Lowell’s players is drafted, and he, Evan Campbell, a fifth-round draft pick by the Edmonton Oilers, hasn’t played since Feb. 12. Otherwise, you’re looking at a team that has made the NCAA Tournament three times in the last four years — just barely missing out last season after losing the Hockey East Championship in 2015 — and Norm Bazin has a career 122-55-18 record through now his fifth season with the River Hawks. Bazin seems to have it figured out. His teams play hard and earn every bit of success they’ve attained. They’ve built success over the years, without that “one guy” — save for goaltender Connor Hellebuyck a few years back and Boyle this year — leading the charge. BU has good players, but they haven’t gotten the consistent, top-to-bottom effort that they need in order to succeed. O’Regan, Oksanen, Grzelcyk — all good players, obviously, but they’re not going to change the game for BU that a guy like Jack Eichel did. And that’s what successful teams do — when they don’t have that star, they compensate for it with well-rounded, motivated, solid production from all four lines. While early in the year it seemed like the scoring might be spread out a bit for BU, that hasn’t been the case as of late. There are a few pretty good guys leading the way, but none that break through, and significantly more guys lower on the lines that have yet to step up. You can have all the good players you can recruit — all the draft picks or projected picks, all the former national team players — but if that doesn’t translate to a full-team mentality, then it’s just meaningless talk. No one’s stepped up as a star to carry this team, and they haven’t played as enough of a team to compensate for that. BU is, essentially, mathematically in the NCAA Tournament, per College Hockey News’s Pairwise Probability Matrix. So it’s not as if the loss Saturday was season-ending, but it’s certainly a gut punch to the extent that the Terriers don’t have a shot at some form of hardware, beyond an improbable run to the national title game. Though, as Quinn pointed out in his presser, Providence got knocked out in the quarterfinals of last year’s Hockey East Tournament, and…well, we all know how that turned out. So theoretically, it’s not impossible for BU to pull off some sort of deep championship run. But this entire weekend, nothing felt within BU’s reach. If you want to look back to the University of Massachusetts Amherst series, too, that wasn’t exactly pretty, either. This team, frankly, has done very little in recent weeks to instill much confidence going forward. Our go-to photographer, Maddie Malhotra, got some really awesome pictures from tonight, which you can check out in the gallery here. Otherwise, it’s quite difficult to take any positives from this game. That was really, really, really ugly. The University of Massachusetts Amherst gave the No. 9 Boston University men’s hockey team quite the challenge in the first game of the Hockey East Tournament, pushing BU into an overtime contest. 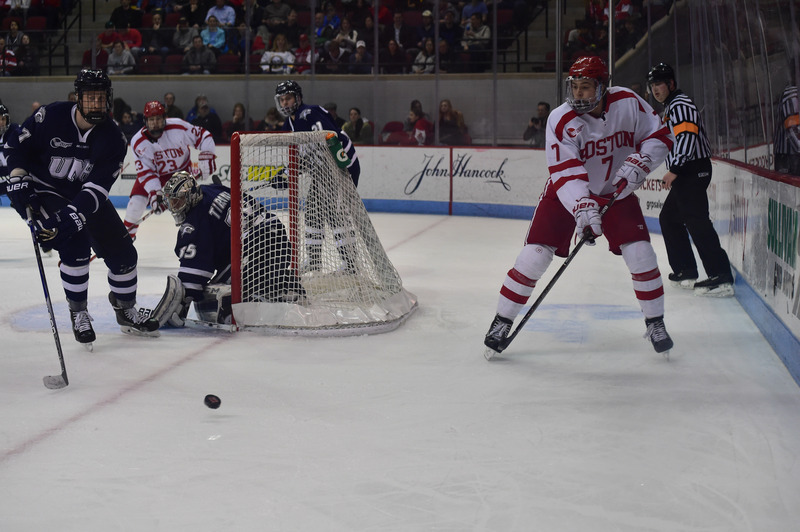 Ultimately, though, the Terriers earned a 2-1 victory to take a 1-0 lead in the best-of-three series at Agganis Arena on Friday night. My pretty immediate reaction after the game is that my only plus on the night was for freshman forward Bobo Carpenter. Judy has more about his two-goal night in her sidebar. After immediately feeling like Carpenter was the only good thing about BU in Friday’s game, I decided that was an unfair sentiment toward senior goaltender Sean Maguire, who had some mindblowing saves in overtime — including one on a delayed penalty where he dove in front of a wide-open net and made a blocker save to keep the score knotted. Twenty-eight saves on 29 shots isn’t too shabby of a night, either. His save percentage on the year is now at .930 and his goals-against average sits at 2.09. It’s hard to pinpoint exactly how lightly the Terriers were taking UMass entering this game, considering they’d beaten them by scores of 7-2 and 6-3 already this season. You could point to the fact that it’s a playoff game, a fresh start, where UMass has nothing to lose. But BU showed next to no urgency through the first two periods — looking like, quite possibly, they have have underestimated just how hard the Minutemen would come out in this game. “Well, they’re 18-to-22-year-olds, and you beat a team 7-2 and 6-3 and there’s 700 people in the building,” Quinn said. “I without question thought that human nature was a factor in the first two periods from our end of it. While Maguire had a good night, UMass goalie Nic Renyard’s was even better. He had a career-best 46 saves in the game, and BU couldn’t figure out how to get past him, save for some great play by Carpenter. That being said, Renyard left plenty of rebounds up for grabs in the slot, however, and BU couldn’t seem to capitalize, as nobody was ever in the right position. Forty-eight shots on goal is an impressive number, but there were even more chances there that the Terriers couldn’t seem to grasp. BU had three total shots on three power plays. That really says it all, but Oksanen had more to say about what’s going wrong on the power play, which hasn’t been right for quite some time. They’ve gotten just one power-play goal in seven attempts over the past three games. Basically — too much passing, not enough shooting. Quinn exaggerated a bit when he said that there were only 700 people in the building, but just 1,752 fans showed up to Agganis Arena on Friday night, which, according to BU Sports Information Director Brian Kelley, is the lowest total in building history for a men’s hockey game. That can probably be partially attributed to the fact that spring break is underway for BU students. Regardless, though, even though it’s UMass and only a first-round matchup — yikes. This weekend’s the last time BU will play at home this year, so just a bit unfortunate. Andrew’s headed off for spring vacation, so he’ll miss tomorrow’s game — thus making Friday night the last time all three of us will cover a game together at Agganis Arena. We’ll have our friend Nick Frazier helping us out tomorrow, but regardless, sad to see our last time together at a place with many, many good memories. SOUTH BEND, Indiana — Golden chances were there for the No. 9 Boston University men’s hockey team, but as head coach David Quinn put it, his team could not take advantage of a single one. Call it poor luck or having the challenge of going against a sharp goaltender, either way BU (19-10-5, 12-6-4 Hockey East) could not pull this one out Saturday night, falling to No. 10 University of Notre Dame, 1-0. Senior goaltender Sean Maguire kept BU in it for most of the night, but his opposer, sophomore Cal Petersen, made 39 saves to preserve the Notre Dame (19-8-7, 15-5-2 Hockey East) shutout. Freshman Dylan Malmquist provided the only offense needed with a power-play goal at the 11:47 mark of the second period. BU’s loss, in conjunction with No. 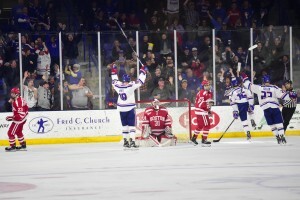 11 University of Massachusetts Lowell’s win over No. 2 Boston College, means the Terriers slipped to the No. 5 seed in Hockey East, so there will be no first-round bye in the cards. BU had the chance to clinch the third or fourth seeds in the conference playoffs under a few scenarios, the easiest of them being a win or tie against the Fighting Irish. But, as I’m sure you’ve read up to this point, BU did neither of those in its regular-season finale. Instead of getting a first-round bye and home ice in the quarterfinals, the Terriers will play host in the first round and have to travel to a road site in the quarterfinals, if they advance out of the opening series. The silver lining in this? BU will host 12th-seeded University of Massachusetts Amherst, a team BU has defeated four times in as many games the last two seasons, outscoring the Minutemen (8-22-4, 2-16-4 Hockey East) by a combined score of 30-11. “Obviously you’re hoping to get a point tonight, allow yourself to get a bye, but didn’t happen and, as a I told our guys, ‘You’re hockey players, you get to play more hockey,'” Quinn said. “That’s how you got to look at it. Right? Obviously lick our wounds from tonight, they can feel sorry for themselves for the next 24 hours, but you get to play more hockey. That’s how you got to look at it. Sarah takes a look at the playoffs in her sidebar. Before Saturday, Petersen had 15 games this season in which he stopped at least 30 shots. Make that 16 now. Whether it was the glove, pads or blocker, Petersen made some terrific saves all night, and Friday for that matter, too. At times, BU was hemmed in its own zone and couldn’t get any offense going toward net, but especially toward the end of the game, the shots came in and Petersen was there for each one. This has been a recurring theme in this section of our articles, so we’ll try and keep this part brief. At times in this game during BU’s power play, it was difficult to even see that the Terriers even had an extra man on the ice. There were a lot of passes in the neutral zone (sloppy ones at that) and not a whole lot of shooting on net. All three man advantages came in the second period, and at least on the first one, BU did next to nothing. On those three power plays, BU totaled four shots, and it wasn’t as if Petersen was pressured in any of these particular instances. More than one thing attributed to the lack of success, Quinn said. “Just, we lost a lot of battles,” Quinn said. “Sometimes what can happen on a power play is you lose sight of the fact that you’ve got to play hockey within a power play. Go here, do this, do that, and you’ve got to play hockey within the power play and I think when we’re not effective on our power play, we don’t play hockey within our power play. We go to our spots. BU’s senior goaltender didn’t face a tremendous number of shots through two periods (13), but he saw a lot of action his way in the early stages of the third. Notre Dame pressed for a game-breaking goal, but Maguire hung in there, making 15 saves on 15 chances. Quinn said Maguire did all of the things he’s been doing all season to be successful in this one. And while the Terriers could not make their final push come to fruition, it wasn’t for a lack of effort. There was almost nothing going on in the Fighting Irish zone in the opening minutes of the third, but around the halfway point, BU made a rush to get the score even. BU had 13 shots and goal and attempted 24, including one in which senior assistant captain Danny O’Regan was denied on in the final five minutes. Freshman defenseman Charlie McAvoy has been on the top pair for most of this season, bringing an offensive element to the game any time he’s on the ice. But tonight, we’ll give him a plus for the crushing hit he put on forward Connor Hurley late in the first period. That’s an impressive use of the body that we haven’t seen all that often from the freshman. No. 9 Boston University men’s hockey head coach David Quinn praised his team last weekend for giving full, 60-minute efforts in two wins over the University of Maine. Those are the kind of games, he said, that are needed down the stretch drive as points become even more valuable. Even against a team like Merrimack College, one that had lost nine in a row coming into Friday, the Terriers would need another complete performance. In another wire-to-wire effort, the Terriers (14-7-4, 8-4-3 Hockey East) shut out Merrimack, 4-0, with the combined efforts of two netminders, senior Sean Maguire and sophomore Connor LaCouvee. Four different Terriers scored en route to BU’s third consecutive win and fourth game in a row which the team has earned at least a point. We’ll take a look at the good, the bad and the straight up weird in this Pluses and Minuses. We’re going to go out on a limb and assume not many people had Matt Lane as their preseason pick to be the team leader in goals. But as of the end of this game, that’s where Lane finds himself, though he is technically tied with his classmate, winger Ahti Oksanen. A week after Maine head coach Red Gendron said his team had “no answer” for Lane and his linemates, Lane scored his 14th goal of the season about halfway through the third period of this one, getting his own rebound and tapping the puck past Merrimack (7-14-5, 2-8-5 Hockey East) goaltender Collin Delia. The goal was one portion of his three-point night, the second straight game that Lane has recorded three points. In his last four outings, Lane is averaging two points per game. A lot of what Lane has done to get better in the goal department, according to Quinn, is the fact that he is adding more practice time to his shooting. “Well, number one, he skates so well,” Quinn said. “Two, he’s really worked on his shot, he’s scored some goal-scorer’s goals. He can really snap it, he gets it off quick, he understands you gotta get inside the hash marks to create some offense and it’s great to see him get rewarded. Speaking of the other skater with 14 goals, Oksanen added his latest tally at the 18:42 mark of the third period, BU’s fourth and final goal. But the goal, in the grand scheme of the game, was irrelevant. However, for Oksanen, it was more than just stat-padder. The empty-netter was Oksanen’s 50th-career goal in the BU uniform, a pretty impressive feat considering the fact that he was a full-time defenseman at this time two years ago. He also joins senior assistant captain Danny O’Regan as the second Terrier to reach the half-century mark in career goals this season. For as much as he shoots the puck — both during games and practice — Oksanen makes it work and continues to be a force any time he touches the puck in the offensive zone. If it hasn’t been apparent already, the big takeaway from this game was the fact that the seniors played well. Four elder statesmen (Lane, Oksanen, O’Regan and captain Matt Grzelcyk) combined for six points in the win. O’Regan’s lone point of the night came on a shorthanded attempt in the second period where he took the puck from center ice and broke all alone on goal, beating Delia up high. Early in the first period during a Merrimack rush, Maguire didn’t quite look himself. It wasn’t the fact that he wasn’t stopping the puck, but he couldn’t move from post-to-post with the quickness that he normally has. But it was no fault of his own. In an unfortunate incident, his skate blade somehow popped off, and he was forced to come out of the game for a 5:49 stretch to get it fixed. In that brief span, Maguire not only lost his bid for a shutout (he would have had to have played the full game), but he also lost his chance for a win. Junior forward Robbie Baillargeon scored what turned out to be the decisive goal, which gave LaCouvee the victory. Sarah has more about this “peculiar” situation in her sidebar. It wasn’t as if the BU penalty kill wasn’t good, as it went a perfect 6-for-6 for the evening. But the fact that the Terriers took six penalties in one game is definitely on the negative side. The second period could have gotten out of hand, with the Warriors garnering seven shots on net. BU’s power play had ample opportunity to get an extra-man goal, but went 0-for-4. Going back to the Terriers’ 1-1 tie with No. 5 Boston College, BU is 1-for-18 on the power play. Quinn held no secrets about his feelings toward the power-play unit on Friday. “Didn’t like it,” Quinn said. “Not surprised we didn’t have success. Just, we’re too slow. We’re too methodical, we’re too slow, there’s no pace to our power play right now, which is kind of funny because it was clicking at a great pace when we came back from Christmas but we’re just, we don’t have a shooter’s mentality, we don’t pass it quick enough.